COLONIE – The Albany Dutchmen were down by a run on Saturday, June 24, with bases loaded in the bottom of the ninth but a questionable strike three call gave the Onondaga Flames a 4-3 win at Siena College. 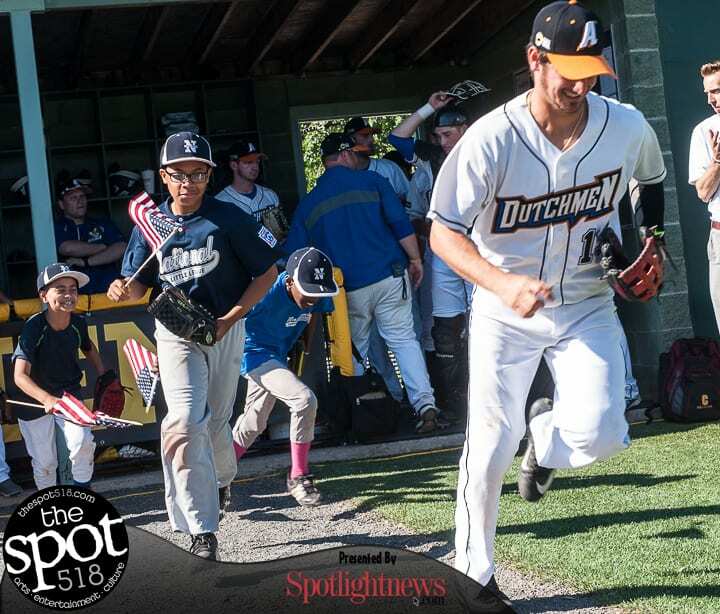 The Dutchmen (10-7) were up 3-1 after seven, but the Flames (11-7) rallied back on a three-run double by Ricky Sisto in the eighth. In the bottom of the ninth, Albany’s Chase Allen had a one-out single followed by a single by Brant Holland and a wild pitch. Jon Skidmore was intentionally walked to set up a potential double play, but Zach Durfee popped out to the catcher. In a tough at bat, with numerous foul balls, Brad Gneiting fought the count from 0-2 to 3-2 before being called out on strikes to end the game. Holland went 3-4 with an RBI for the Dutchmen while Durfee and Chase Allen each had two hits in four at bats. Sam Little went 3-4 for the Flames, accounting for nearly half of the team’s seven hits. Greg Marino went seven innings for Albany giving up five hits while striking out three and not allowing any free passes. Deavan Phillips pitched two-thirds of the eighth and got the loss by giving up three runs on two hits while walking two and striking out one. Justin Bureau pitched an inning and a third and walked one and struck out three. Evan Reichel went six innings for the Flames and got the win by giving up three runs on seven hits while walking one and striking out one. Ryan Greco and Matt Bowman finished up the game for the Flames.